Wattpad’s data team reveals 2017’s most popular topics for fan fiction and original writing among the platform’s young adult Millennial and Gen Z readers. 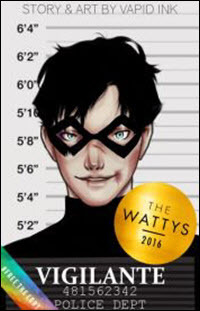 As 2017 draws to a close, Canadian reading and writing platform Wattpad has produced a series of readership trends based on its users behavior. These trends offer publishers some insights into the interests of Wattpad’s 60 million monthly users. In terms of tech, for example, Wattpad Studios’ partnership chief Ashleigh Gardner says the second-screen phenomenon—in which television viewers simultaneously use mobile or other devices to share and interact with the content their are watching on TV—is becoming more influential. “Even in binge-watching,” Gardner says, “people are going through content so fast. We see people wanting more” of a show they’re sharing. That’s the point at which fan-fiction writing kicks in and the writers and their readers on Wattpad basically keep the party going, extending and embellishing storylines, generating new action for characters and plot points. The second screen of choice, then, becomes the Wattpad app on which the viewers are searching out new work that appears almost as fast as they can search for it. It’s Riverdale that’s had the biggest response this year in Wattpad’s tracking of the action on the platform. 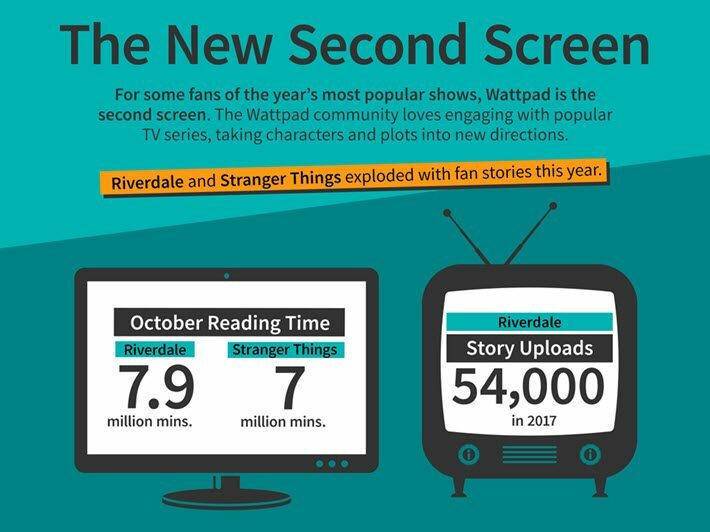 Content based on that series peaked in terms of reading minutes by users in October, when the system recorded 7.9 million minutes on Riverdale-related material. Some 54,000 story uploads related to the show were counted throughout the year. Also in October, Stranger Things drew almost as many users, recording its own high of 7 million reading minutes in material related to that series. But it would be a mistake to think that all is entertainment and TV gossip among the more-than 60 million readers and writers at Wattpad. “It’s been great to see how our users are responding to social movements,” Gardner says, referring to a particularly strong uptake on the #NoMoreBullying movement. One example of this is a paranormal tale called #FatGirlMagic by the writer known as @ClaireKann and responding to the #BodyPositivity theme. Gardner’s team has seen as many as 8 million reading minutes per month going into material based in such widely hashtagged topics and interests. A related such focus, for example, could be seen in #FreeTheLGBT, a push to increase the number of prominent LGBTQ characters in fiction, and this was a big one, with an average 13 million reading minutes monthly. As many as 2,500 new story uploads were made with the tag following the pride activities of June. The writer known on the site as @Vapid_Ink scored big in 2017 with Vigilante rising to massive popularity in the action category: the story pulled more than 2 million reads. The #MeToo movement in sexual harassment awareness has been a major trend on Wattpad this year, but it’s so far been harder to track because the hashtag is applied less precisely than some others are. #MeToo can refer to many things, in other words, and not always to issues related to sexual harrassment. Diversity interests in wider terms drove 4.8 million reading minutes a month to a “person of color” tag (#PoC) . The system tracked an 84-percent growth level during the year for genre stories with diverse characters, too. If publishers have needed any evidence to support a readership’s interest in more diverse character sets, look no farther than Toronto where they could see more than 30 million reading minutes monthly going into tags including #DiverseLit, #Diversity, and #LGBTQ+. 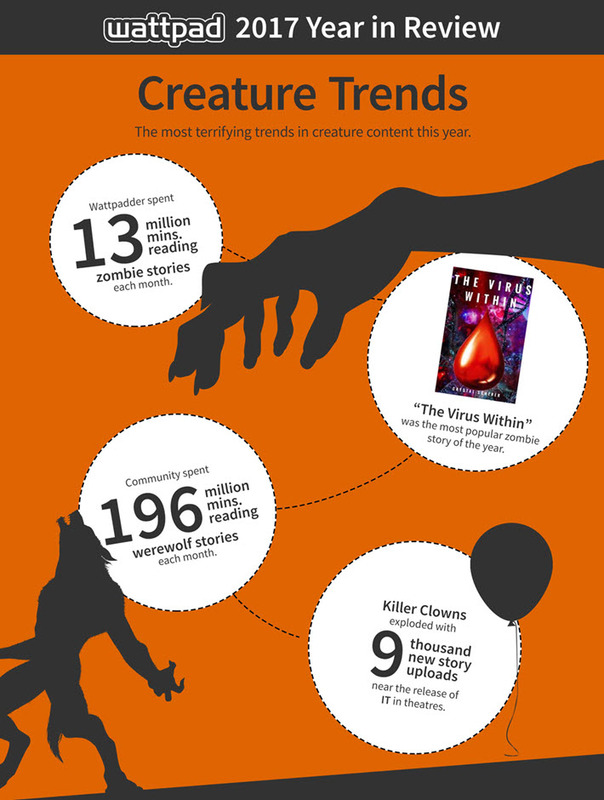 Here are several more trends that Wattpad’s staffers are reporting tracking this year. Gardner confirms that some 70 percent of the platform’s active user base is female and remember that roughly 90 percent accesses the content on mobile devices. K-Pop has been especially popular among Spanish-language users of the platform, which supports some 50 languages. In January of this year, Latin American users shared 12,000 K-Pop story uploads and by July, that trend had increased to 21,000 story uploads. English-language readers seem to love Korean music, too, hitting more than 50 million monthly minutes of K-Pop reading time for the first time in 2017. 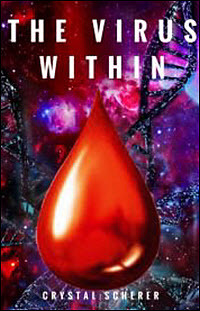 Zombies are an abiding passion for the mostly-millennial crowd of readers and writers at Wattpads, with the writer @CrystalScherer pulling in more than 600,000 reads since January for her The Virus Within. Werewolves, however, seem to be another unholy grail of popularity among horror and sci-fi fans on the platform. Some 196 million minutes each month went to werewolf stories–that’s more than 136,000 days of time–and that’s over a measly (by comparison) 13 million monthly minutes going to zombies. The preponderance of women’s readership on the platform can lead some to think that the whole picture there is romance, but in 2017, but in fact, romance-and-something combinations in terms of genre interests have gained grace this year among Wattpadders. Romance and action seems to have been a favored combo, with romance readers gravitating toward mafia stories and bad-boy bikers. As do we all, surely. As long as we’re in the neighborhood, material relating to the boy band Why Don’t We was attracting almost 20 million reading minutes (13,888 days) per month by August. This one is an especially global attraction according to the sites’ officials, who say they expect WDW fandom to reach even more feverish heights on the big platform in 2018. And as we’ve mentioned in earlier coverage, cannibals seem to have taken on special meaning for many Wattpad regulars. They and killer clowns were two surprise quick gainers on the site, rising in the stats to 9,000 story uploads in September and October. If any over-arching message is inherent in all the data coming in from Canada at the end of this year, it’s engagement. Gardner was at the FutureBook conference in London on the first of December, shortlisted for this year’s Disruptor of the Year FutureBook Award sponsored by the Frankfurter Buchmesse. She heard Eliza Filby’s closing keynote, as covered by Publishing Perspectives, on the rising influence of Generation Z and listened carefully, of course, as that group’s readers now are moving into range of Wattpad’s offerings—the minimum age for participation on the site is 13. “While we’re extremely popular with millennials,” Gardner says, “we’re seeing more and more of the younger group on the platform, too. The 13-to-16 group is a flourishing community online, and that ties into a lot of what Eliza was talking about. “They’re not just consumers,” she says, “they want to participate, they want to write their own stories. We see readers who want to write their own stories. They want to be heard. They want to consume the art their friends are creating. They don’t want celebrities to be out of reach, they want to be able to reach out to them,” as readers at Wattpad interact with their authors. And there’s one more thing that publishers might do well to mull along with the wine over the holidays: speed to market. One of the most striking elements of success at Wattpad is how quickly new content arrives for readers on the platform in reaction to real-world events. Much as we see in the second-screen dynamic, the readers and writers of Wattpad are working far, far faster than much of trade publishing is used to working. Gardner recalls #AlexFromTarget, the cashier whose photo went viral. “Its fascinating to see how quickly people will start to write stories about news stories or memes” for the platform. “A girl had secretly taken a photo of her checkout guy at Target, and he became a teen-heartthrob. The amount of fan fiction we saw about #AlexFromTarget immediately spiked in the next 24 hours, and you still see stories written about him today,” more than two years later. “Some were so inspired by that moment that they wrote the meta-fiction about him, and what it must have been like for him to have people so in love with him. “When it comes to reactions, the creativity and the speed happens as soon as the inspiration hits.” And this presents a challenge to traditional publishing. “That lag to market,” as Gardner puts it, has also meant that the startup of some partnerships with publishers have taken awhile to put into action. But more of these deals will be introduced in 2018, she says. “I’d like to see the industry get to a point where the trends” tracked in real-time on Wattpad “are being listened to. No one in the industry has as much of a direct reader connection as we do.” The potential, she says, is “to be able to show them, ‘This is what people want,'” to capture new market energy on the way up.